Published in 1992, the Encyclopedia contains nearly 1500 articles, including several short unattributed entries in four volumes. The text is approximately one million words, and over 1,850 pages including pictures, maps, charts, index, and appendices. 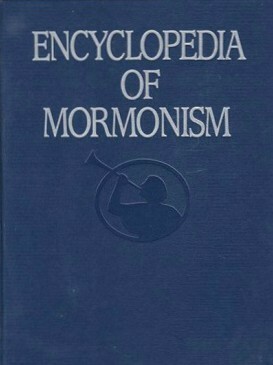 The title for the Encyclopedia of Mormonism was chosen by Macmillan, the secular publisher that initiated the project. The Encyclopedia of Mormonism includes lengthy articles on core LDS subjects like LDS Church history and doctrine, but the work also includes many topics that are less closely related to Mormonism. For example, articles on constitutional law, sports, science, and freedom discuss LDS perspectives and contributions to various fields. ^ Editors (November 1993). "Evaluating the Encyclopedia of Mormonism: Introduction" (PDF). Sunstone (92): 31. Archived from the original (PDF) on 2014-08-15. Smith, George D (November 1993), "Orthodoxy and Encyclopedia: The Book of Mormon in the Encyclopedia" (PDF), Sunstone (92): 48–53, archived from the original (PDF) on 2014-08-15 .